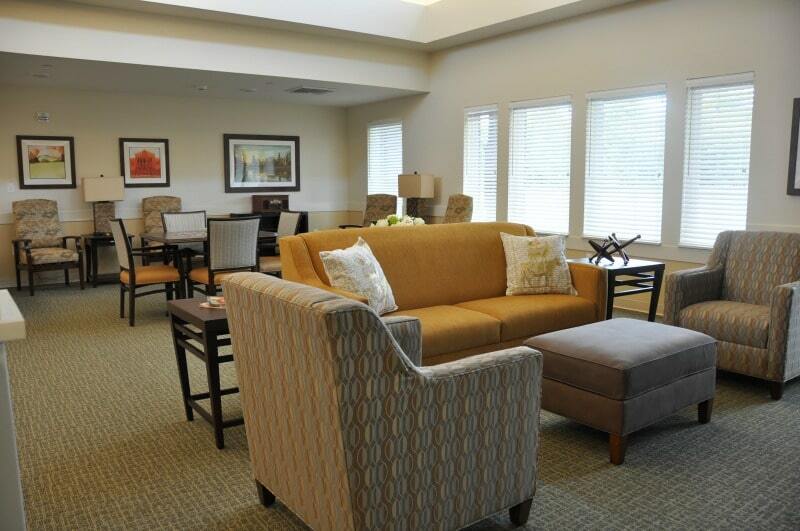 Warner Design Associates has been working with one of the nation’s leading memory care community developers and operators for over three years, helping the company implement appealing, comfortable interior design in several of its locations across the states. Over this time period, Warner Design Associates has completed the interior design for five of its memory care communities and is currently working on four others. Through a process of understanding the client’s challenges and goals, finding innovative solutions, and strategically implementing new learnings at each community, Warner Design Associates has not only produced high-quality design but has been able to establish process and cost efficiencies for the client. Warner Design Associates worked with the client to develop a general palette including furniture and artwork that would be used across all communities. This created process efficiencies but also maintains a cohesive, consistent feel throughout each location. To ensure that each community also had unique touches specific to each location, Warner Design Associates researched local points of interest, history, and cultural information. We then identified artwork relevant to that area and weaved those into the general design to create a more local, familiar feel for the residents. For example, the location in Murrieta, California has themes and imagery of the local vineyards, while the site in Chicago proudly displays historical photos of the city through the centuries. This standard palette approach has allowed Warner Design Associates and the client to work together swiftly and efficiently, while allowing room for custom efforts that enhance the local look and feel. Flooring and carpet is an important consideration in all senior living environments, but is an especially important consideration in memory care communities where there may be more concerns with stains and soiling. 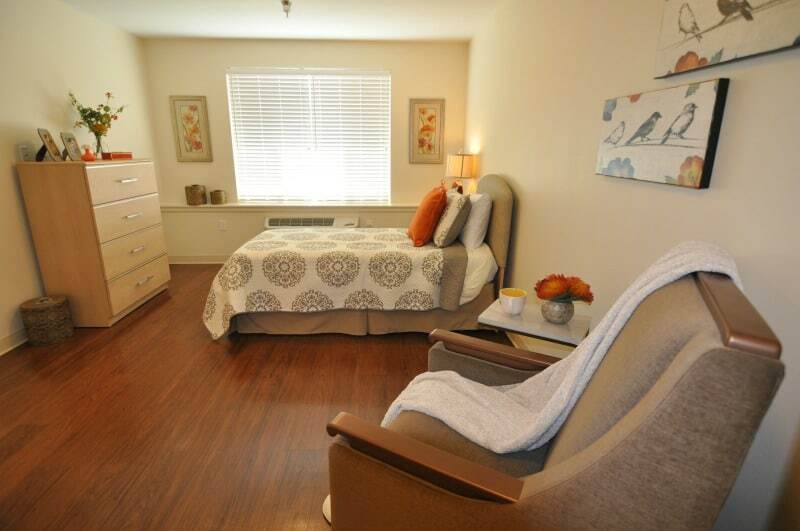 Warner Design Associates knew that the memory care operator needed a carpet solution that allowed areas of the carpet to be removed and replaced without being noticed. They also needed one that had a moisture barrier that would prevent floor damage by stopping any moisture penetration to the subfloor. With that knowledge, Warner Design Associates identified a unique carpet product by Tandus Centiva that would suit all aesthetic, operational and budgetary goals. To demonstrate how beneficial this carpet would be, Warner Design Associates and traveled with members of the client’s team to the carpet manufacturer’s factory in Atlanta. There, the client was able to see first-hand how the carpet was made, learn about its properties, and see an installation demonstration. This product is now being used in all current and future sites and Warner Design Associates, the client and the manufacturer have established the exact product and pricing for streamlined efficiencies. Warner Design Associates sought and selected Kwalu, a manufacturer of attractive yet nearly indestructible furniture that would be a good fit for the memory care communities. Warner Design Associates worked with the manufacturer to create custom furniture and pricing for the client. The custom furniture is made in the unique dimensions and styles needed with a residential look. For each new community, Warner Design Associates communicates the custom pieces needed and the amount, and the client can rest assured knowing the exact furniture, quality and price is consistent across their locations. Each of these scenarios has allowed Warner Design Associates and the client to work together in a time, labor and cost-saving manner. If you are a senior living community operator, how are you implementing process and cost efficiencies in your interior design? Please contact us if you have any questions about how we may be able to help streamline efficiencies while maintaining quality at your locations.